Segue 1 is 50 times dimmer than the star cluster pictured above but is 1000 times more massive, meaning most of its mass must be made up of dark matter. Astronomers have identified the least luminous galaxy known, but it's surprisingly massive. The reason: It is loaded with invisible matter. Dark matter is mysterious, unseen stuff that permeates the universe. Astronomers know it's there because of the gravity it creates. Without invoking dark matter, theories can't explain how galaxies stay together. The galaxy, called Segue 1, is one of about two dozen small satellite galaxies orbiting our own Milky Way galaxy. A separate study last month, reported in the journal Science, found that all the known satellite galaxies are loaded with dark matter. But among them, Segue 1 is special. It is a billion times less bright than the Milky Way. Yet it's nearly a thousand times more massive than its star light would suggest. "Segue 1 is the most extreme example of a galaxy that contains only a few hundred stars, yet has a relatively large mass," said study leader Marla Geha, an assistant professor of astronomy at Yale University. 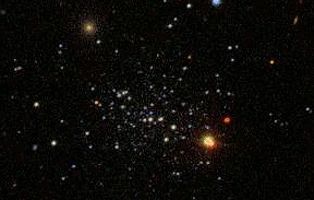 Geha, along with her colleague Josh Simon at the California Institute of Technology, has observed about half of the dwarf satellite galaxies that orbit the Milky Way. These objects are so faint and contain so few stars that at first they were thought to be globular clusters – tightly bound star clusters that also orbit our host galaxy. But by analyzing the light coming from the objects using the Keck telescope in Hawaii, Geha and Simon showed that these objects are actually galaxies themselves, albeit very dim ones. Looking only at the light emitted by these ultra-faint galaxies, the researchers expected them to have correspondingly low masses. Instead, they discovered that they are between 100 and 1,000 times more massive than they appear. Invisible dark matter, she said, must account for the difference. Although dark matter doesn't emit or absorb light, scientists can measure its gravitational effect on ordinary matter and believe it makes up about 85 percent of the total mass in the universe. Dark matter is thought to play a crucial role in galaxy formation, perhaps by contributing to the clumps that stimulate star formation in a budding galaxy and by contributing to the overall matter of a galaxy that allows it to lure other matter and galaxies inward in a growth-by-merger process. The Milky Way, for example, has over billions of years gobbled up many small galaxies, presumably including some like Segue 1. Finding ultra-faint galaxies like Segue 1, which is so rife with dark matter, provides clues as to how galaxies form and evolve, especially at the smallest scales, the researchers say. "These dwarf galaxies tell us a great deal about galaxy formation," Geha said. "For example, different theories about how galaxies form predict different numbers of dwarf galaxies versus large galaxies. So just comparing numbers is significant." It's only recently that astronomers have discovered just how prevalent these dwarf satellite galaxies are, thanks to projects like the Sloan Digital Sky Survey, which imaged large areas of the nighttime sky in greater detail than ever before. In the past two years alone, the number of known dwarf galaxies orbiting the Milky Way has doubled from the dozen or so brightest that were discovered during the first half of the 20th century. Geha predicts astronomers will find even more as they continue to sift through new data. "The galaxies I now consider bright used to be the least luminous ones we knew about," she said. "It's a totally new regime. This is a story that's just unfolding."